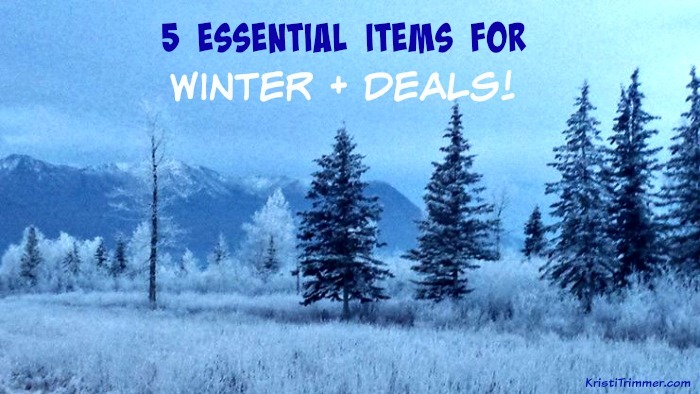 5 Essential Items for Winter + Deals! Living in Alaska is wonderful. Not only do you get to enjoy nature, you also get to met extraordinary people. With the beauty of Alaska also comes the harsh winters and lots of snow. I thought I would share a list of 5 Essential Items to have for Winter. Having a nice, warm coat or parka makes life a lot warmer living up North. I love parkas that are supersoft and cozy. They are great at keeping me warm and protect me from the harsh winters. Heat can escape from your body pretty fast when it’s cold outside. Having a good pair of Winter Boots is essential on staying warm. It is also important to have good traction on your boots. If you live in Alaska I recommend that you have 100% waterproof boots for winter. Vehicles are a wonderful invention. They get us from place to place, but from time to time they can break down especially in cold temperatures. It is important to have bright clothes so that others can see you. This can include bright hats, gloves and a nice warm pair of snow pants. Just something on you that lets others notice you. It is important to be prepared before the cold weather hits. One item that is important to have is an Emergency Car Kit. emergency kits can include flashlights, flares, basic tools, first aid supplies, jumper cables, thermal blankets, snacks, etc. Amazon has a nice selection of Emergency Car Kits. My hands tend to get cold fast in the cold Alaska air. Having a good, warm, waterproof pair of gloves is essential for my safety and warmth. Winter hats are not only fun and fashionable, but they are also important to keep heat in. Having a good Winter hat is important for winter. There are some great sales going on right now too for you to grab some essential winter gear. Moosejaw is offering 20% off almost everything in their Anniversary Sale. Plus you can get up to 50% off past-season Arc’teryx outerwear, clothing, and gear. What are some of your favorite Winter items? Add moisturizer to the list and it’s a perfect list. My skin gets SO dry in the cold. Emergency kits for the car are a must! Hopefully it has at least a blanket or two in it to really keep you warm! I am about to put on the hat and gloves and venture out.. it is freezing today..
Thankyku for this fabulous list of winter reminders!!! I need emergency kits for my car and a hat that permanently stays in the car because I keep forgetting this. I would add a flask to carry. Good list. You need to Moisturize all the time too. All of these things are so essential here in Ireland. I’ve just invested in a new parka and some gorgeous new, non slippy boots! The most important winter accessory I have is an emergency kit in the car. Getting stranded in warm months is a pain. Getting stranded in the dead of winter can be deadly. Great tips! Those are all things that are definitely necessities for the winter. Thanks for sharing, great post! It’s important to have an emergency kit in the car so you can be ready for anything. The coats would also be handy during the winter months. A good pair of boots and a warm coat are always necessary for winter. You’ll be miserable if you don’t have the right gear! Thank you so much for the reminder! I need to make an emergency car kit!! I’m not sure that I need such a heavy coat where I live but you can never go wrong with a first aid kit right? I always forget the emergency kit for the car. I need to put it back there.. You can add a scarf, an extra pair of mittens because you may lose the first pair. I also love wearing parkas and anything for the outer attire to look fashionable, haha. But since it’s commonly hot in the Philippines, we can only wear them during rainy season and when we’re inside air-conditioned places. I keep an emergency kit in the car with some tea lights, a few granola bars, flares and blankets and a bunch of other stuff. I have just bought myself a new winter coat and boots. You reminded me that I probably should get an emergency kit for my car. I don’t have one, and no matter where you live, it’s a good idea. Hat & gloves is a necessity in Chicago. It’ s in the teens today and it’s freezin’ and talking about cold I think I’ll turn up the heat my nose is cold. What a great list of things to have for the winter. I think an emergency kit is important for everyone to have. Here in Fl we only need a light jacket most of the time. Some of mine is that emergency kit especially a blanket when I ran out of gas one time, but also everyone should check that kit in the fall to make sure everything is there, and check those batteries in the flashlight etc. My winter essential is a moisturizer and a chapstick. I have such dry skin. Great Tips! I love some burts bee’s for my lips to keep them moist from the cold. It’s always handy to have emergency kits in our car too. thanks for the idea. Moisturizer and all my warmers are ready for winter. All check I suppose! Keep warm everyone. I need to get some stuff for this winter. I haven’t even bought myself a coat. I need to get my son a new coat. Ugh… Winter can you go away for a bit longer. Yes, Yes, Yes. All of those are necessary items. Especially hats and gloves. A warm jacket of course but hats and gloves are a must. Awesome list! I wish the winter wasn’t so cold! lol Good to have the essentials though!